Website editor’s note: The message below comes from Robina McCurdy from the Localising Food project. Any support that you can give to this important new documentary project would be greatly appreciated. That’s the news we’re looking forward to announcing soon and thanks to friends and colleagues like you we’re looking good! We’ve already passed the 15% mark towards our goal of raising NZ $9,999 by 8 pm on Thursday Sept 22nd to complete production of “Fruits & Nuts Unlimited!” We’re now setting our next benchmark of reaching 25% by this coming Tuesday at 8 pm. Your contribution at any level would be much appreciated! This documentary is our next step in the local food revolution. Consider that for the majority of us, gone is the 1/4 acre suburban section which used to be our birthright, and with it, our right to provide food for our families. In these times of city ‘housing infill’ and ‘back to back’ homes in new housing developments, household food production is almost impossible. We do not have food security in terms of safety, quality or delivery. City dwellers especially are dependent on long-distance supermarket supply, unguaranteed in these times of climate catastrophe and transport uncertainty. We need to substantially increase the amount of open orchards and fruit and nut trees being planted in public places around the country to have any chance of securely feeding our nation. 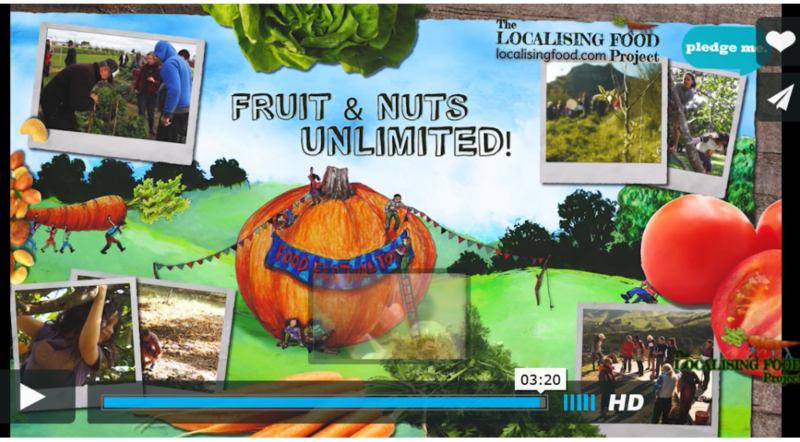 ‘Fruit and Nuts Unlimited’ features a wide range of inspiring examples which can be emulated around the country. These positive projects re-embrace our special heritage varieties lost to over half a century of mass-produced fruit. Through supporting the production of this documentary, you are enabling us to share the fruits of these exemplary nationwide projects, which will feed the generations to come. Find out about our rewards and watch our trailer. What we have captured is a definitive documentation of a unique time, place & space…the birth and growth of the food forest movement in Aotearoa, New Zealand! Your contribution today will help make “Fruit & Nuts Unlimited” possible. This is our second mailout request, and we aim to get to 25% by 8 pm next Tuesday September 6th. Check out our Gift Rewards for each amount on Pledge Me. Gifts include the finished “Fruit & Nuts Unlimited” documentary and access to our last two projects: “Growing Schools” and “SOS: Save Our Seeds” which is currently being shown across Australia and New Zealand to rave reviews. As always I am passionate about personal and community empowerment and creating local food forests and edible landscapes is such a great way to do that. Please help me keep this Crowd Funder off on track to be successful and contribute TODAY if possible. A project of Earthcare Education Aotearoa – an NZ Charitable Trust.